Chemsolv Inc. @ ChemBuyersGuide.com, Inc.
Chemsolv�, Inc. is a leading full-line chemicaldistributor maintaining a large and diverseinventory of industrial and specialty chemicalsand the ability to provide many value addedservices. 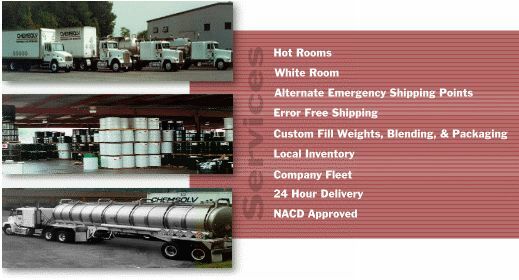 As a member of the NACD we arecommitted to environmentally sound managementpractices and Responsible Distribution.We strive for excellence in all areas of ourbusiness, and emphasize safety, strong customerservice, quality assurance and our desireto exceed the expectations of our customerson every order. Whether its Distribution orDistillation, our five locations are capable ofproviding the service, quality and diversityrequired to meet the growing demands of ourindustry. Call us today!